On Saturday April 6th we will have our 11th taster menu night. Tables are going fast so books soon! Here is the menu. The menu is all vegan. Please book by phone or pop into the café. There are seats available from 6pm to 8pm. To avoid the queues why not phone your order in advance and give us a time you want to pick up. Call 0191 276 3935.
check out our sandwich menu. We have added over sixty free recipes to the website. They include dishes that have been featured on our menus at some point over the last ten years. Enjoy! We are open for lunch from Monday to Sunday and have a full takeaway available. Sadly we can't offer takeaway in the evening. To book for the evening please call 0191 209 2571. We don't usually take bookings for the lunch time but if you have a large party then please call to reserve a table. Apple and vanilla cake with apple puree filling and apple crisps. 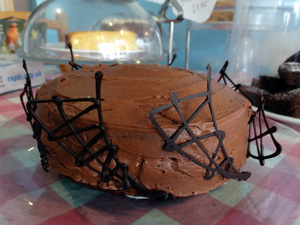 Chocolate and vanilla cake with chocolate frosting. 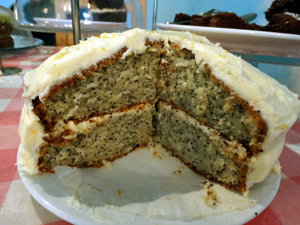 Lemon and poppy seed sponge with lemon frosting.